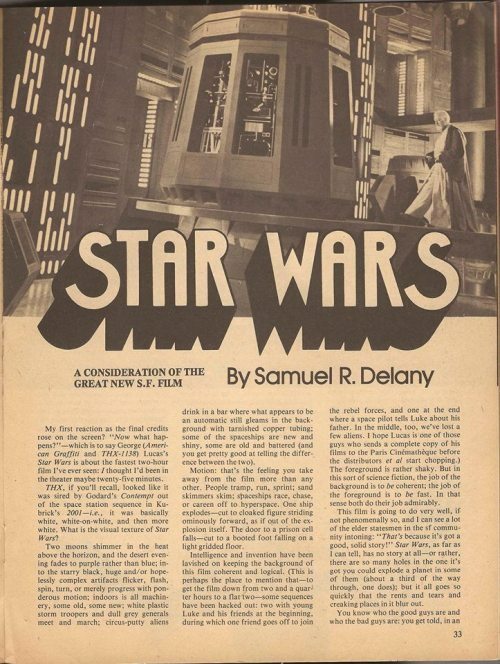 samueldelany:Samuel Delany reviews the first Star Wars movie, 1977, in Cosmos Science Fiction and Fantasy. One of the big Hollywood blockbusters to hit the silver screen this year has been Mad Max: Fury Road, which has gotten rave reviews, with many praising the insane and complex visual design of the film. Suppose you were sitting at home, relaxing on a sofa with your dog, when suddenly your visual image of the dog gave way to that of a steaming bowl of noodles. You might find that odd, no? Now suppose that not just the dog changed, but the sofa too. As the film writer Anne Billson has pointed out most critics were wrong about John Carpenter’s The Thing when it was first released in 1982. In general they hated it and damned the film as “too phony looking to be disgusting. It qualifies only as instant junk. A man wakes up one morning to find himself slowly transforming into a living hybrid of meat and scrap metal; he dreams of being sodomised by a woman with a snakelike, strap-on phallus. HOLLYWOOD, California—Picture a movie theater, packed for the opening night of a blockbuster film. Hundreds of strangers sit next to each other, transfixed. They tend to blink at the same time. Even their brain activity is, to a remarkable degree, synchronized. It’s a slightly creepy thought. The visuals of both the desolate Antarctic and the ever-morphing alien creatures in The Thing were envisioned long before the movie was shot. Extensive storyboards were drawn by artist Michael Ploog so that all the departments of the production were on the same page in their preparation for the shoot. This is nothing new… but the similarity between the storyboards and the final imagery shot by legendary DP Dean Cundey is staggering. Storyboards are often only a guide, but in this film they were so specifically rendered that they became gospel. The detail and artistry of Ploog’s work up front, allowed the crew to have clear and defined goals on those frigid shooting days in both Alaska and Canada. Legit Re-presentation by Nick Briz / @nbriz - based on his series of Martin Arnold inspired GIFs Part of the #GIFbites Project for Bitrates Exhibition L↺↻p it! Last Tango Inception (head blob) by Annabel Frearson / @frankensteintoo Part of the #GIFbites Project for Bitrates Exhibition L↺↻p it!